On October 11th, the Network for Public Education hosted the first Public Education Nation event in Brooklyn, New York. The event focused on “Changing the Conversation” and allowed critics of the current education reform agenda a platform to discuss ways to improve public schools. The event was chaired by edu-blogging celebrity Anthony Cody. Tennessee was represented at the event by teacher and President of the Franklin County Education Association Lucianna Sanson. She previously answered some questions for us about her trip to DC with the Badass Teachers Association. I attended the Public Education Nation Event, in Brooklyn on Saturday, October 11, 2014 to listen, learn, make connections, and build relationships with other education activists across the country. I was honored to be asked by Anthony Cody, author of The Educator and the Oligarch, and award-winning edu-blogger at “Living in Dialogue,” to take part in the event as a social media moderator. What I took away from the NPE event was that we all have to work together and become community activists in order to, as Jitu Brown said, “kill” corporate ed reform. Memphis, Shelby County, Nashville, Knoxville, and Chattanooga, are all feeling the pressure applied by the heavy hand of the Achievement School District as it lays chains of Charters across the state. Teachers in Tennessee are stressed, demoralized, over-worked, and under-paid in many districts. Tennessee teachers should all watch the archived videos of the NPE event. The panels featured students, administrators, college administrators, parents, and classroom teachers. The panelists are passionate and determined to save our public schools. Watching the panels will give TN teachers the knowledge that we are not alone in the battle here in the Volunteer state. TN teachers can learn how to band together and speak about the attrocities happening in our public schools. 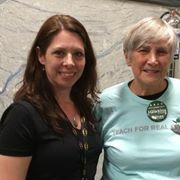 Tennessee teachers, I encourage you to speak the truth about toxic testing, developmentally inappropriate standards, loss of arts and recess, and the systematic removal of experienced teachers replaced by green Teach for America recruits. TN teachers need to realize that they have a voice and they can use it to speak truth to power and stand up to the Corporate Bully of Ed Reform because we do have allies across the Nation that are watching and are willing to help us fight back corporate ed reform. We begin by having honest dialogue with parents about what the testing is like in our schools. We educate parents on what is happening. We discuss with our students the affects that the testing is having on them. We inform our parents that they can refuse certain tests for their child. We can listen to the voices of our students when they have a concern about being tested. We can encourage our students to speak up about testing and the effects it is having on their educational experience. My message for Tennessee policymakers is to stop listening to the corporate millionaries, especially the Koch brothers (yes, Williamson County, I am talking to you) and start listening to the teachers before our state loses our most valuable asset, our public school system, to venture capitalist vultures who grow fat while starving our students. Tennessee Politicians- Here are my questions for you: Are you willing to sacrifice our children and our public schools to corporate America? A corporate America that knows nothing about education, or education practice? Or will you choose to embrace community schools, listen to experienced educators, and allow our tax dollars to support our public schools? One last tidbit from the forum. At the end of the finale, when Diane Ravitch and Jitu Brown were taking questions, I stood up and spoke to them about the ed reform situation in TN. I spoke about Memphis and Shelby County being merged and excessing veteran teachers. I spoke about TFA staffing the schools. I spoke about Nashville struggling to fight back the ASD invasion. I also mentioned our brave advocy groups here in Tennessee: the TN BATs, BEARs, TREE, and SPEAK, and how we network across the state to keep each other informed on the shenanigans going on in our state. I wanted people to know that Tennessee needs to be on the radar as a targeted state. For more on the event, see Russ Walsh’s take.